Mary Jane Kyarsgaard, 81, of Wyoming, Iowa, died Thursday, March 10, 2011, at Jones Regional Medical Center in Anamosa, Iowa. A Celebration of Life Service will be held on Monday, March 14, 2011 at 2:00 p.m. at Lahey Funeral Home, Wyoming, where friends may call after 1:00 p.m. Burial will be in the Wyoming Cemetery, Wyoming, Iowa. 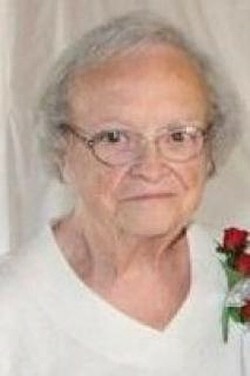 Mary Jane was born October 9, 1929 in Anamosa, Iowa, to Robert and Alice (Fuhrmeister) Alden. She worked in bookkeeping and telemarketing at Citizens State Bank in Wyoming and at the former Jackson State Bank in Maquoketa. Mary Jane was a member of the Onslow Presbyterian Church, where she played organ for many years. She was also a member of the Oxford Junction Legion Auxiliary. She enjoyed baking cookies and cakes. Mary Jane is survived by her son, Steve (Marijane) Kyarsgaard of Monmouth; four grandchildren and seven great-grandchildren. She was preceded in death by her parents and one sister Helen Riches.